The Fjaerland01493 856339work01493 856339fax Guest AccommodationPat and Vic welcome you to The Fjaerland in Great Yarmouth, an award winning establishment with an enviable position overlooking a colourful landscaped square, set back from the bustling seafront, just seconds from the beach with wonderful sea views from many rooms. Free parking permits available for on street public parking for our guests. Ideally located for the seafront, Central Beach, St. Georges Park and the town centre, you can be assured of a warm welcome at The Fjaerland. All 12 bedrooms are en suite, most of which have sea views. Flatscreen TV's with Freeview, hospitality tray, hairdryer, radio clock alarm and free infinity WiFi in all rooms. 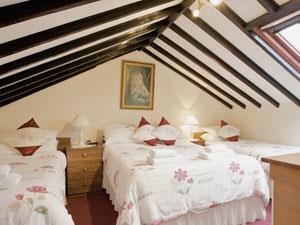 All bedrooms and bathrooms have been recently refurbished to the highest standards. We have a fully licensed bar, a separate small TV lounge, and a large dining room with separate tables seating 29. Our freshly prepared breakfast menu as detailed below is served daily from 8am. Variety of cereals, grapefruits segments, prunes, fresh fruit salad, assorted yogurts, fresh milk & fresh fruit juices. Fried or scrambled eggs with grilled sausage from H. Blakes our finest local butcher, bacon, tomatoes and baked beans. Fried, scrambled or poached eggs on two toast. Scrambled eggs topped with shavings of smoked salmon and served with brown bread & butter. Beans or tomatoes on two toast. Bacon and or egg toasted sandwich. Kippers served with brown bread and butter. Just a short stroll from The Fjaerland, visitors will find the refurbished seafront with road train and tourist bus in season, wide esplanade and sandy beaches. The Marina Centre with swimming pool, sports and leisure facilities is just across the road, with Britannia Pier, Wellington Pier, the Pleasure Beach and much, much more also on the seafront. Telephone 01493 856339 or 07803859951 for details and colour brochure. Reduced weekly rates available on request. Please telephone to book. Sleeps 2 adults and 2 children. Can fit extra z-bed for third child. Please enquire at time of booking. Pat and Vic welcome you to The Fjaerland in Great Yarmouth, an award winning establishment with an enviable position overlooking a colourful landscaped square, set back from the bustling seafront, just seconds from the beach with wonderful sea views from many rooms. Free parking permits available for on street public parking for our guests. Small minibus coaches accepted only. Children welcome from any age. The region is easily accesssible by road from all parts of the UK. Major trunk roads into Norfolk are the M11, A11, A12 and the A14 from London and the South-east, while the A47 and A14 serve the Midlands and the North. On approaching Great Yarmouth follow signs for SEA FRONT. The Fjaerland is half way between Britannia Pier and Wellington Pier opposite Marina Leisure Centre in Trafalgar Road.